General Motors manufactures vehicles in 37 countries; its core automobile brands include Chevrolet, Buick, GMC, and Cadillac. It also owns or holds controlling interest in foreign brands such as Holden, Wuling, Baojun, and Jiefang. Annual worldwide sales volume reached a milestone of 10 million vehicles in 2016. The company also operates a mobility division called Maven, which operates car-sharing services in the United States, and is studying alternatives to individual vehicle ownership. GM Defense is General Motors' military defense division, catering to the needs of the military for advanced technology and propulsion systems for military vehicles. General Motors led global vehicle sales for 77 consecutive years from 1931 through 2007, longer than any other automaker, and in 2012 was among the world's largest automakers by vehicle unit sales. General Motors acts in most countries outside the U.S. via wholly owned subsidiaries, but operates in China through 10 joint ventures. :18, 96 GM's OnStar subsidiary provides vehicle safety, security and information services. In 2009, General Motors shed several brands, closing Saturn, Pontiac, and Hummer, and emerged from a government-backed Chapter 11 reorganization. In 2010, the reorganized GM made an initial public offering that was one of the world's top five largest IPOs to date, and returned to profitability later that year. General Motors Company was formed with an escrow account set up by R S McLaughlin for 15 years of Buick Motors in 1907 on September 16, 1908, in Flint, Michigan, as a holding company controlled by William C. Durant, owner of Buick. At the beginning of the 20th century, there were fewer than 8,000 automobiles in the U.S., and Durant had become a leading manufacturer of horse-drawn vehicles in Flint helped by his purchase of the Carriage Gear patent from the McLaughlin family in Canada, in the 1880s and 1890s, before making his foray into the automotive industry in 1904 by purchasing the fledgling Buick Motor Company. GM's co-founder was Charles Stewart Mott, whose carriage company was merged into Buick prior to GM's creation in 1918. Over the years, Mott became the largest single stockholder in The USA, and spent his life with his Mott Foundation, which has benefited the city of Flint, his adopted home. GM acquired Oldsmobile later that year. In 1909, Durant brought in Cadillac, Elmore, Oakland, and several others. Also in 1909, GM acquired the Reliance Motor Truck Company of Owosso, Michigan, and the Rapid Motor Vehicle Company of Pontiac, Michigan, the predecessors of GMC Truck. Durant, along with R. S. McLaughlin, lost control of GM in 1910 to a bankers who held the Escrow account' trust, because of the large amount of debt taken on in its acquisitions, coupled with a collapse in new vehicle sales. The next year, Durant started the Chevrolet Motor Car Company in the U.S., and in Canada in 1915, and through this, he and McLaughlin in Canada secretly purchased a controlling interest in GM. Durant regained control of the company after one of the most dramatic proxy wars in U.S. business history. Durant then reorganized General Motors Holding Company into General Motors Company in 1916, merging Chevrolet with GM and allying General Motors of Canada Limited in 1918 after McLaughlin Traded his Outstanding Stocks for GM stocks to allow the Corporation in the USA . Shortly thereafter, he again lost control, this time for good, after the new vehicle market collapsed. Alfred P. Sloan was picked to take charge of the corporation, and led it to its post-war global dominance when the seven manufacturing facilities operated by Chevrolet before Chevrolet acquired the company began to contribute to GM operations. These facilities were added to the individual factories that were exclusive to Cadillac, Buick, Oldsmobile, Oakland, and other companies acquired by the corporation. This unprecedented growth of GM would last into the early 1980s, when it employed 349,000 workers and operated 150 assembly plants in the USA. On July 10, 2009, General Motors emerged from government backed Chapter 11 reorganization after an initial filing on June 8, 2009. Through the Troubled Asset Relief Program the US Treasury invested $49.5 billion in General Motors and recovered $39 billion when it sold its shares on December 9, 2013 resulting in a loss of $10.3 billion. The Treasury invested an additional $17.2 billion into GM's former financing company, GMAC (now Ally). The shares in Ally were sold on December 18, 2014 for $19.6 billion netting $2.4 billion. A study by the Center for Automotive Research found that the GM bailout saved 1.2 million jobs and preserved $34.9 billion in tax revenue. Also in 2009 General Motors of Canada Limited was not part of the General Motors Chapter 11 Bankruptcy, the company shed several brands, closing Saturn, Pontiac, and Hummer, while selling Saab Automobile to Dutch automaker Spyker, and emerged from a government-backed Chapter 11 reorganization. In 2010, the reorganized GM made an initial public offering that was one of the world's top five largest IPOs to date, and returned to profitability later that year. Based on global sales, General Motors is routinely among the world's largest automakers. 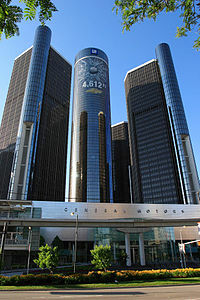 Headquartered at the Renaissance Center in Detroit, GM employs approximately 180,000 people around the world. In 2009, General Motors sold 6.5 million cars and trucks globally; in 2010, it sold 8.39 million. As of April 2019[update], Mary Barra is the chief executive officer (CEO) and chairman of the board and Mark Reuss is the president. The head of design, Edward T. Welburn, was the first African American to lead a global automotive design organization, and was the highest ranking African American in the US motor industry in 2014. On April 7, 2016, he announced his retirement from General Motors after 44 years, effective July 1, 2016. He was replaced by Michael Simcoe. As part of the company's advertising, Ed Whitacre announced the company's 60-day money-back guarantee and repayment of a $6.7 billion loan from the government ahead of schedule. On December 12, 2013, GM announced that Mary Barra, 51, executive vice president, Global Product Development, Purchasing and Supply Chain, was elected by the board of directors to become the next CEO of the company succeeding Dan Akerson on January 15, 2014. Barra also joined the GM board. From June 2009 to March 2011, the company had three chief executive officers and three chief financial officers. The company has reported annual profits since 2010. It can carry forward previous losses to reduce tax liability on future earnings. It earned $4.7 billion in 2010. The Wall Street Journal estimated the tax break, including credits for costs related to pensions and other expenses, can be worth as much as $45 billion over the next 20 years. In 2010, General Motors ranked second on the list with 8.5 million units produced globally. In 2011, GM returned to the first place with 9.025 million units sold worldwide, corresponding to 11.9% market share of the global motor vehicle industry. The top two markets in 2011 were China, with 2,547,203 units, and the United States, with 2,503,820 vehicles sold. The Chevrolet brand was the main contributor to GM performance, with 4.76 million vehicles sold around the world in 2011, a global sales record. On April 24, 2014, CNNMoney reported that GM profits fell to $108 million for the first three months of 2014. GM now estimates the cost of their 2014 recall due to faulty ignition switches, which have been linked to at least 124 deaths, at $1.5 billion. Shares of GM were down 16% for the year before the new announcement of GM's lower profits. On January 4, 2016, Fortune reported that GM led a $1 billion equity financing in the transportation network company (TNC) Lyft.com. This was GM's first investment in the ride-sharing ventures and its reported participation ($500,000,000) in the round is considered to be indicative of its efforts towards the future of transportation, which it believes will be "connected, seamless and autonomous". General Motors Canada Limited is the Canadian allied subsidiary of General Motors. The employees are not all Canadian, as some salaried personnel are from the U.S. and work for the company. GM products focus primarily on its four core divisions — Chevrolet, Cadillac, As the Corporation has shuttered plants Buick, and GMC. The GM restructuring has resulted in a lower break-even point for annual sales and renewed profits because of the loss of millions of jobs. In mid-2005, GM announced that its corporate chrome power emblem "Mark of Excellence" would begin appearing on all recently introduced and all-new 2006 model vehicles produced and sold in North America. However, in 2009 the "New GM" reversed this, saying that emphasis on its four core divisions would downplay the GM logo. In May 2012, GM recorded an 18.4% market share in the U.S. with stock imported. In November 2018, GM announced it would lay off more than 14,000 employees in North America, comprising 15% of its workforce and 25% of its executive staff in the region. The company plans to cease production in three assembly (Lordstown Assembly in Ohio, Detroit-Hamtramck Assembly in Michigan and Oshawa The first GM Corporation in North America 1918 in Canada) and two engine/transmission (White Marsh, Maryland, and Warren, Michigan) plants during 2019. Employees from those plants would also be made redundant. In 2008 the third largest individual country by sales was Brazil with some 550,000 GM vehicles sold. In that year the other South American countries Argentina, Colombia, and Venezuela sold another 300,000 GM vehicles, suggesting that the total GM sales in South America (including sales in other South American countries such as Chile, Peru, Ecuador, Bolivia, etc.) in that year were at a similar level to sales in China. On April 20, 2017, General Motors announced that the Venezuelan government had seized the General Motors Venezolana plant in Valencia. Prior to their sale to Groupe PSA in 2017, Opel was the main GM brand name in Europe except in the United Kingdom, where Opel's British subsidiary, Vauxhall, used its own "Vauxhall" brand name. The Chevrolet brand was reintroduced in Europe in 2005, selling mostly rebranded Daewoo cars acquired by GM Korea. After having lost approximately $18B over 12 years, GM began phasing out mainstream sales of Chevrolet in Europe in late 2013, and finished by late 2015, to focus on Opel/Vauxhall. Chevrolets continue to be sold in Russia and the Commonwealth of Independent States, through the GM Uzbekistan joint venture. Chevrolet still has a limited presence in Europe through imports of the Corvette and Camaro, while Cadillac maintains a limited presence as well. In 2012, PSA Peugeot Citroen and General Motors formed an alliance, which involved General Motors acquiring seven percent of the PSA Group. The ownership was soon divested on December 13, 2013, generating "gross proceeds of €0.25 billion." By 2017, Groupe PSA considered taking over Opel from GM, after GM reported a loss of $257 million from its European operations on 2016, the sixteenth consecutive loss-making year for GM in Europe, bringing its amount losses in Europe since 2000 to more than US$15 billion. On March 6, 2017 the sale of Opel and Vauxhall to the PSA Group for $2.3 billion was confirmed. The company manufactures most of its China market vehicles locally. Shanghai GM, a joint venture with the Chinese company SAIC Motor, was created With Canadian Regal in 1990 on March 25, 1997. The Shanghai GM plant was officially opened on December 15, 1998, when the first Chinese-built Buick came off the assembly line. The SAIC-GM-Wuling Automobile joint-venture is also successfully selling microvans under the Wuling brand (34 percent owned by GM). Much of General Motors' recent growth has been in the People's Republic of China, where its sales rose 66.9 percent in 2009, selling 1,830,000 vehicles and accounting for 13.4 percent of the market. Buick is strong in China from early Introduction by the Canadian Buick sold to the last Emperor of China, later being led by the Buick Regal 1990 subcompact. The last emperor of China owned a Buick. The Cadillac brand was introduced in China in 2004, starting with exports to China. GM pushed the marketing of the Chevrolet brand in China in 2005 as well, transferring Buick Sail to that brand. In August 2009 the joint venture of FAW GM Light Duty Commercial Vehicle Co Ltd was formed that mainly produces Jiefang light-duty trucks. General Motors vehicle sales in China rose 28.8 percent to a record 2,351,610 units in 2010. GM set up an auto research center as part of a US250 million corporate campus in Shanghai to develop 'gasoline-hybrid cars, electric vehicles and alternative fuels, engines and new technologies'. The company plans to double its sales from 2010 to about 5 million units in China by 2015. SAIC-GM-Wuling established the low-cost Baojun brand to better compete with domestic rivals, Chery, Geely and BYD for first-time buyers of cars priced around USD10,000. It is estimated that such market in China is about 5 million vehicles a year, larger than the auto market in France and Britain combined. However, some are worried that 'local brands like Baojun could eventually become threats to their parent brands if they compete more against established models over time'. Shanghai-GM-Wuling sold 1.23 million vehicles in 2010, mainly commercial vans and trucks, of which about 700,000 units were a van called Sunshine. GM maintains a dealership presence in Japan, called GM Chevrolet Shop, previously known as GM Auto World Shop. Current GM Japan dealerships were either former Saturn dealerships or Isuzu dealership locations. GM products are also currently sold by the company Yanase Co., Ltd. since 1915. In August 2011, GM announced plans to reactivate its plant that previously produced rebadged Chevrolet Blazer as Opel as well as Brazilian Blazer, and also build a new plant in Bekasi, West Java, Indonesia, which would produce 40,000 passenger cars per year for the Southeast Asian market. It is the third plant in Southeast Asia, after the Rayong plant, Thailand, and the Hanoi plant, Vietnam. On March 11, 2013, GM opened a new 190,300 square-foot manufacturing plant in Bekasi, Indonesia. In February 2015, GM announced they will close the Bekasi plant by the end of June and stop production of the Sonic in Thailand by mid-year. GM announced on May 18, 2017 that it would exit the Indian market, which it had entered for the second time in 1996. The first time was in 1928, when it became the first car maker to manufacture cars in India. GM would however continue to manufacture cars from its Talegaon, Maharashtra plant for the export market. This plant has a capacity of 1,60,000 units annually. The older Halol, Gujarat plant with a capacity for 50,000 units stopped production on April 28, 2017. It will be sold, with GM in talks with China's SAIC Motor Corporation Ltd. The India arm's domestic sales for April 2016 – March 2017 declined to 25,823 units from 32,540 the previous year and market share contracted from 1.17 percent to 0.85 percent for the same period. However, exports surged 89 percent during the same period to 70,969 units. GMTC-I, GM's technical center in Bengaluru, India will continue doing its global work. About 400 employees, 8 percent of GM's total Indian work-force, would be affected by the pull-out. Weak product line-up and below par service quality were the reasons for the poor showing by GM in India. It will also affect 10,000 employees working with about 120 Outlets/Dealership of GM in India. In February 2018, comments by CEO Mary Barra that GM's Korean operations' cost structures had "become challenging" fuelled speculation that the company might divest GM Korea, followed by a market exit. GM is currently negotiating a $2.8 billion investment plan for its Korean operations from the South Korean government, to be dispersed over the next decade. Furthermore, the company approached the Korea Development Bank to participate in a $2.7 billion debt swap issued by its Korean subsidiary. According to the South Korean unit of General Motors, its domestic sales for March dropped by 58 percent, which is more than half compared to the past year. In February 2018, General Motors had said to shut down one factory and then decide what lies ahead for the remaining three plants in South Korea during rising losses there. In recent years, the US automaker pulled its Chevy brand from Europe which wedged GM Korea's exports since it was a major market for the Korean firm. GM has a long history in Egypt which began in the 1920s with the assembly of cars and light pickup trucks for the local market. In the mid of the 1950s, GM withdrew from the Egyptian market. Some years later, the Ghabbour Brothers began to assemble Cadillac, Chevrolet and Buick models up to the 1990s. Since 1983 GM and Al-Monsour Automotive Company have owned General Motors Egypt, which is currently the only manufacturer of traditional GM branded vehicles in Egypt. In the 1920s Miller Brothers Nigeria was founded as an importer of commercial vehicles of the Bedford brand into the country. In 1949, the company opened its own assembly plant and operated under the name Niger/Nigeria Motors. In 1965 the plant and its distribution network was split into different companies and renamed as Federated Motors Industries. In 1991 the company was taken in by a joint venture between General Motors and UACN of Nigeria. Another manufacturing base of the GM for the African markets is the Industries Mécaniques Maghrébines headquartered in Kairouan, Tunisia, which assembles Isuzu and Mazda models for the Maghreb region. Formed in 1975, General Motors East Africa (GMEA) was the largest assembler of commercial vehicles in the region exporting them from Kenya to East and Central African countries including Uganda, Tanzania, Malawi, Rwanda and Burundi. Its facility located in Nairobi assembled a wide range of Isuzu trucks and buses including the popular Isuzu N-Series versatile light commercial vehicle, TF Series pick-ups and Isuzu bus chassis. In addition to assembly, GMEA also marketed the Chevrolet products Spark and Optra. Selling entire GM's 57.7 per cent stake in General Motors East Africa to Isuzu was announced on February 28, 2017. After finishing the sale, GMEA was renamed to Isuzu East Africa Limited, effective from August 1, 2017. General Motors began operating in South Africa in 1913 through its wholly owned subsidiary, General Motors South Africa. Following the passage of the Comprehensive Anti-Apartheid Act in 1986, GM was forced to divest from South Africa, and GMSA became the independent Delta Motor Corporation. GM purchased a 49% stake in Delta in 1997 following the end of apartheid, and acquired the remaining 51% in 2004, reverting the company to its original name. By 2014 it was targeting the production of 50,000 cars a year but was being hampered by national labour unrest, strikes and protests. In May 2017, GM announced that it would exit the South Africa market by the end of 2017 by selling part of the business to Isuzu and look for a buyer for the rest of the business. In New Zealand, GM was represented by locally assembled Chevrolet, Pontiac and Vauxhall cars from 1926. In 1954 sales of fully imported Holden vehicles began. New Zealand assembly of Holdens began in 1957 and through the early 1960s, Holdens replaced all Chevrolets and most Vauxhalls. Tariffs on Australian-made cars were eventually removed and local assembly plants closed by 1991. GM New Zealand was renamed Holden in 1994. In Australia, GM has been represented by the Holden brand since 1948. Chevrolets and Pontiacs were also manufactured in Australia until 1968. In 2012, GM established Opel as a niche marque in Australia and began to sell Opel cars in Australia. However, less than twelve months later, Opel sales ceased. On December 10, 2013, GM announced that Holden would cease manufacturing operations in Australia by the end of 2017. Holden's Australian presence now only consists of a national sales company, a parts distribution centre and a global design studio. GM has participated over the years in the World Touring Car Championship (WTCC), 24 Hours of Le Mans, NASCAR, SCCA, Supercars Championship, and many other world venues. GM's engines were highly successful in the Indy Racing League (IRL) throughout the 1990s, winning many races in the small V-8 class. 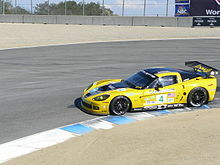 GM has also done much work in the development of electronics for GM auto racing. An unmodified Aurora V-8 in the Aerotech, captured 47 world records, including the record for speed endurance in the Motorsports Hall of Fame of America. Recently, the Cadillac V-Series has entered motorsports racing. GM has also used many cars in the American racing series NASCAR. Currently the Chevrolet Camaro ZL1 is the only entry in the series, but in the past the Pontiac Grand Prix, Buick Regal, Oldsmobile Cutlass, Chevrolet Lumina, Chevrolet Malibu, Chevrolet Monte Carlo, Chevrolet Impala, and the Chevrolet SS were also used. GM has won a total of 40 Monster Energy NASCAR Cup Series manufacturer's championships, including 34 with Chevrolet, the most of any make in NASCAR history, 3 with Oldsmobile, 2 with Buick, and 1 with Pontiac. GM leads all other automobile manufacturers in races won in NASCAR's premier series at 1,011. Chevrolet leads individual makes with 677 wins. In Australia, there is the V8 Supercar Championship which is battled out by the two main rivals of (GM) Holden and Ford. The current Holden Racing Team cars are based on the Holden Commodore and run a 5.0-litre V8-cylinder engine producing 635 bhp (474 kW). These cars have a top speed of 298 km/h (185 mph) and run 0–100 km/h in 3.8 seconds. The Holden Racing Team is Australia's most successful team in Australian touring car history. In 2006 and 2007, the drivers' championship was won by the very closely linked (now defunct) HSV Dealer Team. Research and development (R&D) at General Motors began organically as the continuation of such R&D as the various divisions (e.g., Cadillac, Buick, Olds, Oakland) were already doing for themselves before the merger. Its character was entirely empirical; it was whatever key people in each company had been competent enough to organize and pursue. R. S. McLaughlin's Carriage Company in 1876 was designing and inventing Carriage Gear. The McLaughlin Companies became General Motors of Canada Limited. Charles F. Kettering's Dayton Engineering Laboratories Company (Delco), at Dayton, Ohio, was still an independent firm at this time. Its work was well known to GM central management through its relationship as a supplier and consultancy to Cadillac and Buick. In 1916, Durant organized the United Motors Corporation as an amalgamation of parts suppliers, supplying GM and other OEMs but independent of GM. Alfred P. Sloan, head of the newly acquired Hyatt Roller Bearing Corporation, became United Motors' CEO. United Motors acquired Delco, and Kettering began his association with Sloan. United Motors also acquired at this time the original Remy corporation (called the Remy Electric Company), a competitor of Delco. In 1918 General Motors bought United Motors. Various entities grew out of the original Delco and Remy, including the Dayton Metal Products Corporation, the General Motors Research Corporation, the Delco Division and Remy Electric Division of GM, Delco Remy (now Remy International, Inc.), ACDelco, Delco Electronics, and others. Today's main successor corporation is Delphi Automotive, which nowadays is an independent parent corporation. In 1911, Charles F. Kettering, with Henry M. Leland, of Dayton Engineering Laboratories Company (DELCO) invented and filed U.S. Patent 1,150,523 for the first electric starter in America. In 1914, Cadillac introduced the first mass-produced production V-8 in the world. In 1921, General Motors patented the use of Tetraethyllead as an antiknock agent leading to the development of higher compression engines resulting in more power and efficiency even though much later it was realized that lead in gasoline was harmful to various biological organisms including humans. In 1937, Jominy & Boegehold of GM invented the Jominy end-quench test for hardenability of carbon steel, a breakthrough in heat treating still in use today as ASTM A255. In 1939, GM introduced the world's first automatic transmission the Hydra-matic for the 1940 Oldsmobile and would be adopted by the auto industry later. In 1962, GM introduced the first turbo charged engine in the world for a car in the Oldsmobile Cutlass Turbo-Jetfire. In 1971, the Lunar Rover, a partnership between GM's Delco Defense Electronics Division and Boeing traversed the surface of the Moon. In 1972, GM produced the first rear wheel Anti-lock brake system in the world for two of their cars: the Toronado and Eldorado. In 1984, Robert Lee of GM invented the Fe14Nd2B permanent magnet, fabricated by rapid solidification. Although GM R&D (as it is known in colloquial shorthand) began as an organization largely built around one man (Kettering), it eventually evolved into a more modern organization whose path is shaped by individuals but not dominated entirely by any of them. World War II was a turning point wherein military affairs, after mingling with the technologies of applied science for some 80 years, first started to become fundamentally reinvented by them. Civilian life, too, changed in this direction. By the 1950s, corporations such as GM and many others were facing a new era of R&D, different from earlier ones. Less about genius inventors and individual inventions, and more about organizational progress and integrated systems, it raised new questions about where the capital for R&D would come from in an era of limitless demand for R&D (although not necessarily for production). Alfred Sloan, longtime CEO of GM (1920s to 1960s), discussed in his memoir (also considered a seminal management treatise) the relationships between government, academia, and private industry in the areas of basic science and applied science, in light of this new era. The views he laid out reflected (and influenced) wide consensus on these relationships that persists largely to today. Today, GM R&D, headquartered in Warren, Michigan, is a network of six laboratories, six science offices, and collaborative relationships in over twelve countries including working relationships with universities, government groups, suppliers, and other partners from across the globe. On September 7, 2014, at the Intelligent Transport Systems World Congress in Detroit GM disclosed it would be introducing auto-pilot features into certain 2017 models of its cars, which would go on sale in 2016. The "super cruise" or vehicle-to-vehicle V2V technology is likely to be first introduced to the Cadillac range, enabling drivers to switch in and out of semi-automated mode. In December 2016, General Motors announced it would begin testing self-driving vehicles on public roads in Michigan, after Gov. Rick Snyder signed a package of bills legalizing the operation of autonomous vehicles. In March 2016, General Motors bought Cruise Automation, a San Francisco self-driving vehicle start-up, to develop self-driving cars that could be used in ride-sharing fleets. In October 2017, General Motors acquired Strobe, a solid state LIDAR company. Strobe's prototypes produce brief "chirps" of frequency-modulated (FM) laser light, where the frequency within each chirp varies linearly. Measuring the phase and frequency of the echoing chirp allows the system to directly measure both the distance and the velocity of objects in the road ahead. Strobe, Cruise and GM will work together to develop the technology for future self-driving cars. In November 2017 Two self-driving Chevy Bolt EV cars were seen during a media event by Cruise Automation, GM's autonomous car unit, in San Francisco, California, U.S.. The automaker is already operating self-driving Chevy Bolts in San Francisco as part of a beta test run by the company's subsidiary. In October 2018, Honda announced the investment of $2.75 billion in GM's self-driving car unit. The firm announced an initial investment of $275 million initially, followed by $2 billion within the year. From the 1920s onward, General Motors always maintained an internal dialog about what its economy-car and small-car policies should be. The economy and size considerations often naturally overlapped, although a strong distinction was always drawn in the 20th century between policies for the U.S. market and policies for other markets. Economy (in some form) always had good demand anywhere, but its definition in the U.S. was long considered different from that in other markets. In this view, "economy" in the U.S. did not mean "small" in the sense of what qualified as "small" outside the U.S. The policy discussion often focused on topics like the higher demand for truly small cars in non-U.S. markets than in the U.S., and whether it made more sense to import a car into a certain country or to build it domestically within that country, either as some variant of knockdown or with truly extensive domestic sourcing. GM's acquisitions of Vauxhall Motors Ltd (UK, 1925) and Adam Opel AG (Germany, 1929), rather than starting new domestic companies to compete against them, were based on analyses that convinced GM managers that acquiring an existing domestic manufacturer was a better business decision. Although GM since the 1920s has always offered economy models in the U.S. market (relative to that market's definition in any given decade), and had done research and development in the 1940s and 1950s in preparation for any potential rise of strong demand for truly small cars in the U.S. market, it has also been criticized over the decades for not doing enough to promote fuel efficiency in the U.S. market in the 1970s through 1990s. GM's response has been that it has always responded to market demands, and that most Americans, despite anything they said to the contrary, did not actually demand (at purchasing-decision time) small size or fuel efficiency in their vehicles to any great or lasting extent. Although some U.S. consumers flocked temporarily to the ideal of fuel economy whenever fuel supply crises arose (such as 1973 and 1979), they flocked equally enthusiastically to SUVs when cheap fuel of the 1980s and 1990s temporarily shielded them from any downside to these choices. Since the return of high fuel prices in the 2000s and 2010s, GM's interest in truly small-car programs for the U.S. market has been renewed. As part of General Motors Company development, GM revived one of its idled U.S. factories for the production of a small car in Orion, Michigan, with the creation of 1,200 American jobs. This will be the first time that GM produced a sub compact car in the United States since the Chevrolet Chevette ended production in 1986. This retooled plant will be capable of building 160,000 cars annually, including both small and compact vehicles. 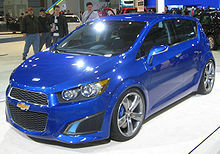 Production started in late 2011 with the Chevrolet Sonic. The Chevrolet Volt, a series plug-in hybrid, ranks as the U.S. all-time top-selling plug-in electric car with 148,556 units sold through October 2018. General Motors has published principles regarding the environment and maintains an extensive website to inform the public. In 2008, General Motors committed to engineering half of its manufacturing plants to be landfill-free. In order to achieve its landfill-free status, production waste is recycled or reused in the manufacturing process. The world's largest rooftop solar power installation was installed at General Motors Spanish Zaragoza Manufacturing Plant in fall 2008. The Zaragoza solar installation has about 2,000,000 square feet (190,000 m2) of roof at the plant and contains about 85,000 solar panels. The installation was created, owned and operated by Veolia Environment and Clairvoyant Energy, who lease the rooftop area from General Motors. In 2011, General Motors also invested $7.5 million in solar-panel provider Sunlogics, which will install solar panels on GM facilities. GM has long worked on alternative-technology vehicles, and has led the industry with ethanol-burning flexible-fuel vehicles that can run on either E85 (ethanol) or gasoline. The company was the first to use turbochargers and was an early proponent of V6 engines in the 1960s, but quickly lost interest as muscle car popularity increased. They demonstrated gas turbine vehicles powered by kerosene, an area of interest throughout the industry, but abandoned the alternative engine configuration in view of the 1973 oil crisis. In the 1970s and 1980s, GM pushed the benefits of diesel engines and cylinder deactivation technologies with disastrous results due to poor durability in the Oldsmobile diesels and drivability issues in the Cadillac V8-6-4 variable-cylinder engines. In 1987, GM, in conjunction with AeroVironment, built the Sunraycer, which won the inaugural World Solar Challenge and was a showcase of advanced technology. Much of the technology from Sunraycer found its way into the Impact prototype electric vehicle (also built by Aerovironment) and was the predecessor to the General Motors EV1. GM supported a compromise version of the Corporate Average Fuel Economy (CAFE) standard increase from 27 to 35 mpg‑US (8.7 to 6.7 L/100 km; 32 to 42 mpg‑imp), the first such increase in over 20 years. GM announced they will introduce more Volt-based plug-in hybrids. The company has publicly announced that it is committed to invest heavily in electric cars. In October 2017, GM's executive vice president of global development, Mark Reuss, announced that GM's vehicle lineup would feature 20 electric car models by 2023. In May 2004, GM delivered the world's first full-sized hybrid pickups, the 1/2-ton Silverado/Sierra. These mild hybrids did not use electrical energy for propulsion, like GM's later designs. In 2005, the Opel Astra diesel Hybrid concept vehicle was introduced. The 2006 Saturn Vue Green Line was the first hybrid passenger vehicle from GM and is also a mild design. GM has hinted at new hybrid technologies to be employed that will be optimized for higher speeds in freeway driving. 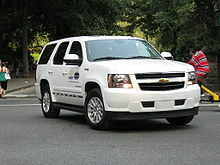 GM offered the 2-mode hybrid system in the 2008–2013 Chevrolet Tahoe/GMC Yukon/Cadillac Escalade, and 2009–2013 GM 1/2 half-ton pickups. This hybrid technology, co-developed with DaimlerChrysler and BMW, was first used by GM in a diesel-electric hybrid powertrain (manufactured by Allison Transmission) for transit buses, starting in 2004. Within the framework of its vehicle electrification strategy, GM introduced the Chevrolet Volt in 2010 as an Extended-Range Electric Vehicle (EREV), an electric vehicle with back-up generators powered by gasoline, or series plug-in hybrid. The production Chevrolet Volt was available in late 2010 as a 2011 model with limited availability. GM delivered the first Volt during December 2010. The second-generation Volt was launched in the U.S. and Canada in October 2015. The second generation has an upgraded drivetrain and improved battery system that increased the all-electric range to 53 miles (85 km) from 38 miles (61 km). In November 2018, GM announced it would cease Volt production in March 2019. As of October 2018[update], global Volt/Ampera family sales totaled about 177,000 units since its inception in December 2010, including over 10,000 Opel/Vauxhall Amperas sold in Europe up to December 2015. The Volt family of vehicles ranked as the world's all-time top-selling plug-in hybrid as of September 2018[update], and it is also the third best selling plug-in electric car in history after the Nissan Leaf (375,000) and the Tesla Model S (253,000), as of October 2018[update] . The Chevrolet Volt is also the U.S. all-time top-selling plug-in electric car with 148,556 units delivered through October 2018. General Motors was the first company (in the modern era) to release an all-electric automobile. In 1990, GM debuted the "Impact" concept car at the Los Angeles Auto Show. It was the first car with zero-emissions marketed in the US in over three decades. The Impact was eventually produced as the EV1 for the 1996 model year. It was available through dealers located in only a few regions (e.g., California, Arizona, Georgia). Vehicles were leased, rather than sold, to individuals. In 1999 GM decided to cease production of the vehicles. When the individual leases had expired, they declined to renew the leases or allow the lessors to purchase them. 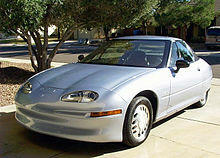 All of the EV1s were eventually returned to General Motors and, with the exception of a few which were donated to museums, all were destroyed. The documentary film Who Killed the Electric Car? covered the EV1 story. The EV1's cancellation had disappointed supporters of electric vehicles. In 2010, GM debuted the Chevrolet Volt, a plug-in hybrid electric vehicle with back-up generators powered by gasoline (range-extended electric vehicle). General Motors has announced that it is building a prototype two-seat electric vehicle with Segway. An early prototype of the Personal Urban Mobility and Accessibility vehicle—dubbed Project P.U.M.A. – was presented in New York at the 2009 New York International Auto Show. In October 2011, General Motors announced the production of the Chevrolet Spark EV, an all-electric version of the third generation Chevrolet Spark, with availability limited to select U.S. and global markets. In October 2012, GM Korea announced it will start making and selling the Spark EV domestically in 2013. The production version was unveiled at the 2012 Los Angeles Auto Show. Within the framework of GM's vehicle electrification strategy, the Spark EV is the first all-electric passenger car marketed by General Motors in the U.S. since the EV1 was discontinued in 1999. The Spark EV was released in the U.S. in selected markets in California and Oregon in June 2013. Retail sales began in South Korea in October 2013. GM also plans to sell the Spark EV in limited quantities in Canada and select European markets. GM began production of the Chevrolet Bolt EV in October 2016, the first ever mass market all-electric car with a range of more than 200 miles (320 km). Deliveries in California are scheduled to begin in late 2016. The vehicle will be launched in all 50 US states and analysts expect it to sell around 30,000 units per year, though GM itself has not confirmed these estimates. The battery pack and most drivetrain components are built by LG and assembled in GM's Lake Orion plant. GM builds battery packs in southern Michigan. GM also established an automotive battery laboratory in Michigan. GM will be responsible for battery management systems and power electronics, thermal management, as well as the pack assembly. An existing GM facility at Brownstown Township was chosen to be upgraded as battery pack plant. LG Chem's U.S. subsidiary, Compact Power of Troy, Michigan, has been building the prototype packs for the development vehicles and will continue to provide integration support and act as a liaison for the program. The 1966 GM Electrovan is credited with being the first hydrogen fuel cell car ever produced. Though fuel cells have been around since the early 1800s, General Motors was the first to use a fuel cell, supplied by Union Carbide, to power the wheels of a vehicle with a budget of "millions of dollars". In 2002, it was reported that GM spent about $100 million a year in research and development of fuel cell vehicle. In June 2007, Larry Burns, vice president of research and development, said he's not yet willing to say exactly when hydrogen vehicles would be mass-produced, but he said it should happen before 2020, the year many experts have predicted. He said "I sure would be disappointed if we weren't there" before 2020. On July 2, 2013, GM and Honda announced a partnership to develop fuel cell systems and hydrogen storage technologies for the 2020 time frame. GM and Honda are leaders in fuel cell technology, ranking No. 1 and No. 2, respectively, in total fuel cell patents filed between 2002 and 2012, with more than 1,200 between them according to the Clean Energy Patent Growth Index. GM produces several flexible-fuel vehicles that can operate on E85 ethanol fuel or gasoline, or any blend of both. Since 2006 GM started featuring a bright yellow gas cap to remind drivers of the E85 capabilities. GM is the leader in E85 flex fuel vehicles, with over 6 million FlexFuel vehicles on the road in the U.S. In 2010, GM pledged to have more than half of their annual vehicle production be E85 or biodiesel capable by 2012. As of 2012, GM offers 20 ethanol-enabled FlexFuel cars and trucks in the US, and offers more FlexFuel vehicles models than any other automaker. GM Defense is the GM division leveraging GM's advanced technology propulsion systems, including Hydrotec Fuel Cell and Jouletec batteries for a variety of military applications including autonomous electric platforms and flex fuel cell pickups converted for military use. Since 1994, General Motors has donated over $23 million in cash and vehicles to the Nature Conservancy, and funding from GM supports many conservation projects. In 1996, GMC partnered with the fashion industry as a part of the GM/CFDA Concept: Cure, a collaboration between General Motors and the Fashion industry bringing awareness to and raising funds for breast cancer. The program involved 5 designers, each lending their artistic talents to customize 5 different vehicles. Nicole Miller, Richard Tyler, Anna Sui, Todd Oldham and Mark Eisen were tasked with transforming a Cadillac STS, Buick Riviera, GMC Yukon, Oldsmobile Bravada and Chevrolet Camaro Z28, respectively. The cars were then auctioned with the proceeds presented to the Nina Hyde Center at the Greater Los Angeles Auto Show in 1997. Since 1997, the GM Foundation has been a source of funding for Safe Kids USA's "Safe Kids Buckle Up" program, a national initiative to ensure child automobile safety through education and inspection. Through 2002, the PACE Awards program, led by GM, EDS, and SUN Microsystems, has given over $1.2 billion of in-kind contributions which includes computers to over 18 universities to support engineering education. In 2009, the GM led group has helped the Pace Awards program worldwide. In 2004, GM gave $51,200,000 in cash contributions and $17,200,000 in-kind donations to charitable causes. The General Motors Foundation (GM Foundation) receives philanthropic bequests from General Motors. It is a 501(c)(3) foundation incorporated in 1976. As it emerged from bankruptcy and company reorganization in 2010, GM structured its brand portfolio (brand architecture). Some nameplates like Pontiac, Saturn, Hummer, and service brands like Goodwrench were discontinued. Others, like Saab, were sold. The practice of putting the "GM Mark of Excellence" on every car, no matter what the brand, was discontinued in August 2009. The company has moved from a corporate-endorsed hybrid brand architecture structure, where GM underpinned every brand to a multiple brand corporate invisible brand architecture structure. The company's familiar square blue "badge" has been removed from the Web site and advertising, in favor of a new, subtle all-text logo treatment on its U.S. site; the Canadian site still retains the blue "badge". In 2011, GM discontinued the Daewoo brand in South Korea and replaced it with the Chevrolet brand. GM holds about 96% of GM Korea (2011–present) which mainly designs and produces Chevrolet and Holden branded vehicles. GM holds about 25% of GM Uzbekistan (2008–present) which produces Ravon, Chevrolet and Daewoo branded vehicles. The 1936–1937 Flint sit-down strike against General Motors changed the United Automobile Workers (UAW) from a collection of isolated locals on the fringes of the industry into a major labor union and led to the unionization of the domestic United States automobile industry. After the first convention of UAW in 1936, the union decided that it could not survive by piecemeal organizing campaigns at smaller plants, as it had in the past, but that it could organize the automobile industry only by going after its biggest and most powerful employer, General Motors Corporation, focusing on GM's production complex in Flint, Michigan. Organizing in Flint was a difficult and dangerous plan. GM controlled city politics in Flint and kept a close eye on outsiders. According to Wyndham Mortimer, the UAW officer put in charge of the organizing campaign in Flint, he received a death threat by an anonymous caller when he visited Flint in 1936. GM also maintained an extensive network of spies throughout its plants. This forced UAW members to keep the names of new members in secret and meeting workers at their homes. As the UAW studied its target, it discovered that GM had only two factories that produced the dies from which car body components were stamped: one in Flint that produced the parts for Buicks, Pontiacs, and Oldsmobiles, and another in Cleveland that produced Chevrolet parts. While the UAW called for a sit-down strike in Flint, the police, armed with guns and tear gas, attempted to enter the Fisher Body 2 plant on January 11, 1937. The strikers inside the plant pelted them with hinges, bottles, and bolts. At the time, Vice President John Nance Garner supported federal intervention to break up the Flint Strike, but this idea was rejected by President Franklin D. Roosevelt. The president urged GM to distinguish a union so the plants could re-open. The strike ended after 44 days. 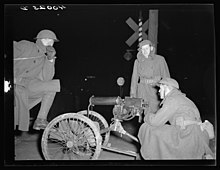 The tool and die strike of 1939, also known as the "strategy strike", was an ultimately successful attempt by the United Auto Workers Union (UAW) to be recognized as the sole representative for General Motors workers. In addition to representation rights, the UAW, working jointly with the Congress of Industrial Organizations (CIO), sought to resolve existing grievances of skilled workers. 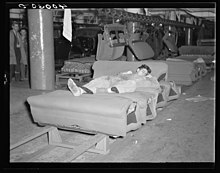 From November 21, 1945 until March 13, 1946 (113 days), CIO's United Automobile Workers (UAW), organized "320,000 hourly workers" to form a US-wide strike against the General Motors Corporation, workers used the tactic of the sit down strike. It was "the longest strike against a major manufacturer" that the UAW had yet seen, and it was also "the longest national GM strike in its history." As director of the UAW's General Motors Department (coordinator of union relations with GM), Walter Reuther suggested to his colleagues the idea of striking the GM manufacturing plants with a 'one-at-a-time' strategy, which was "intended to maximize pressure on the target company." Reuther also put forth the demands of the strikers: a 30 percent increase in wages and a hold on product prices. However, the strike ended to the dissatisfaction of Walter Reuther and the UAW, and the workers received only a 17.5-percent increase in wages. The 2007 General Motors strike was a strike from September 24 to 26, 2007, by the United Auto Workers against General Motors. On September 24, 2007, General Motors workers represented by the United Auto Workers union went on strike against the company. The first US-wide strike against GM since 1970 was expected to idle 59 plants and facilities for an indefinite period of time. Talks broke down after more than 20 straight days of bargaining failed to produce a new contract. Major issues that proved to be stumbling blocks for an agreement included wages, benefits, job security and investments in US facilities. Within hours, the ripple effect was felt in Canada with closures of two car assembly plants in Oshawa, Ontario, and a transmission facility in Windsor on September 25. However, on September 26, a tentative agreement was reached, and the strike's end was announced by UAW officials in a news conference at 4 a.m. By the following day, all GM workers in both countries were back to work. Between 1938 and 1950, General Motors (GM) monopolized the sale of buses and supplies to National City Lines (NCL) and its subsidiaries, as part of a deliberate plot to purchase and dismantle streetcar systems in many cities in the United States as an attempt to monopolize surface transportation. Unsafe at Any Speed by Ralph Nader, published in 1965, is a pioneering book accusing car manufacturers of being slow to introduce safety features, and reluctant to spend money on improving safety. The subject for which the book is probably most widely known, the rear-engined GM Chevrolet Corvair, is covered in the first chapter. It relates to the first (1960–1964) models that had a swing-axle suspension design which was prone to "tuck under" in certain circumstances. In substitution for the cost-cutting lack of a front stabilizer bar (anti-roll bar), Corvairs required tire pressures which were outside of the tire manufacturer's recommended tolerances. The Corvair relied on an unusually high front to rear pressure differential (15psi front, 26psi rear, when cold; 18 psi and 30psi hot), and if one inflated the tires equally, as was standard practice for all other cars at the time, the result was a dangerous oversteer. In early March 1966, several media outlets, including The New Republic and The New York Times, alleged that GM had tried to discredit Ralph Nader, hiring private detectives to tap his phones and investigate his past, and hiring prostitutes to trap him in compromising situations. Nader sued the company for invasion of privacy and settled the case for $425,000. Nader's lawsuit against GM was ultimately decided by the New York Court of Appeals, whose opinion in the case expanded tort law to cover "overzealous surveillance". Nader used the proceeds from the lawsuit to start the pro-consumer Center for Study of Responsive Law. A 1972 safety commission report conducted by Texas A&M University concluded that the 1960–1963 Corvair possessed no greater potential for loss of control than its contemporary competitors in extreme situations. The U.S. Department of Transportation (DOT) issued a press release in 1972 describing the findings of NHTSA testing from the previous year. NHTSA had conducted a series of comparative tests in 1971 studying the handling of the 1963 Corvair and four contemporary cars—a Ford Falcon, Plymouth Valiant, Volkswagen Beetle, and Renault Dauphine—along with a second-generation Corvair (with its completely redesigned, independent rear suspension). The 143-page report reviewed NHTSA's extreme-condition handling tests, national crash-involvement data for the cars in the test as well as General Motors' internal documentation regarding the Corvair's handling. NHTSA went on to contract an independent advisory panel of engineers to review the tests. This review panel concluded that "the 1960–63 Corvair compares favorably with contemporary vehicles used in the tests [...] the handling and stability performance of the 1960–63 Corvair does not result in an abnormal potential for loss of control or rollover, and it is at least as good as the performance of some contemporary vehicles both foreign and domestic." Former GM executive John DeLorean asserted in his book On a Clear Day You Can See General Motors that Nader's criticisms were valid. Journalist David E. Davis, in a 2009 article in Automobile Magazine, noted that despite Nader's claim that swing-axle rear suspension were dangerous, Porsche, Mercedes-Benz, and Volkswagen all used similar swing-axle concepts during that era. In May 2014 the NHTSA fined the company $35 million for failing to recall cars with faulty ignition switches for a decade, despite knowing there was a problem with the switches. General Motors paid compensation for 124 deaths linked to the faulty switches. The $35 million fine was the maximum the regulator could impose. General Motors has announced that they are also facing 79 customer lawsuits asking for as much as $10 billion for economic losses attributed to the recall. As well as the Cobalts, the switches of concern had been installed in many other cars, such as the Pontiac G5, the Saturn Ion, the Chevrolet HHR, the Saturn Sky, and Pontiac Solstice. Eventually the recall involved about 2.6 million GM cars worldwide. ^ a b "Department of State, Division of Corporations". General Information Name Search. State of Delaware. August 11, 2009. p. File#=4718317. Archived from the original on January 6, 2010. Retrieved April 14, 2015. ^ a b c "About General Motors". General Motors. 2018. Retrieved January 30, 2018. ^ "Mary Barra | GM Corporate Officer". GM. June 2017. Retrieved July 23, 2017. ^ Churchill, Lexi (June 15, 2018). "GM's new 39-year-old CFO Dhivya Suryadevara is making history". CNBC. Retrieved July 14, 2018. ^ a b c d e f g "General Motors Company 2018 Annual Report (Form 10-K)". U.S. Securities and Exchange Commission. February 6, 2018. Retrieved April 6, 2019. ^ "Form 10-K Annual Report Pursuant to Section 13 or 15(d) of the Securities Exchange Act of 1934 for the Fiscal Year Ended December 31, 2012 Commission File Number 001-34960 General Motors Company" (PDF). General Motors. February 15, 2013. Archived from the original on August 6, 2013. Retrieved August 6, 2013. ^ Marr, Kendra (January 22, 2009). "Toyota Passes GM as World's Largest Automaker". The Washington Post. Retrieved February 10, 2017. ^ "Our Brands". General Motors. Retrieved November 18, 2018. ^ a b Isidore, Chris (February 7, 2017). "GM sells 10 million cars for first time thanks to China". CNN. Retrieved April 3, 2018. ^ "China car sales slump ripples globally". BBC News. UK. October 12, 2018. Retrieved November 19, 2018. ^ Szczesny, Joseph (July 8, 2013). "Milestone: China Is General Motors' Biggest Market". CNBC. US. Retrieved November 19, 2018. ^ a b c "General Motors Company 2011 Annual Report" (PDF). General Motors Company. Archived from the original (PDF) on January 24, 2013. ^ "GM's Maven Gig is a car sharing service tailor-made for the gig economy". techcrunch.com. May 3, 2017. Retrieved December 11, 2017. ^ Wayland, Michael (October 9, 2017). "General Motors establishing new military defense division". Automotive News. US. Retrieved October 16, 2018. ^ Galligan, Kathleen (January 19, 2012). "GM again the world's largest automaker". Detroit Free Press. Archived from the original on January 1, 2016. Retrieved January 20, 2012. ^ "Shanghai OnStar Announces Launch Date for Services in China". media.gm.com. ^ a b Brady, Diane (February 16, 2012), "Record profits, but still mixed success at GM", Bloomberg Businessweek, archived from the original on March 27, 2012, retrieved March 10, 2012. ^ "History of General Motors, Company profile". General Motors. Archived from the original on September 25, 2007. Retrieved April 4, 2011. ^ "GM 1910 the founder departs". Archived from the original on December 13, 2013. Retrieved December 10, 2013. ^ Nishimoto, Alex (February 23, 2015). "15 Vehicles With The Longest Running Nameplate". Motor Trend. Retrieved April 21, 2016. ^ "2010 Buick LaCrosse Test Drive: Can New 30-MPG Buick Sedan Revive the Brand?". Popular Mechanics. July 16, 2009. Retrieved March 22, 2016. ^ "Buick, Big in China from the first sales by the McLaughlin's, Seeks to Recapture U.S. Glory". CBS News. March 23, 2010. Retrieved March 22, 2016. ^ Vlasic, Bill (July 10, 2009). "G.M. Vow to Slim Includes Top Ranks". The New York Times. Retrieved September 9, 2012. ^ Maynard, Micheline (July 10, 2009). "A Primer on the New General Motors". The New York Times. Retrieved July 10, 2009. ^ Amadeo, Kimberly. "Auto Industry Bailout (GM, Ford, Chrysler)". About News. Retrieved July 20, 2015. ^ Gardner, Greg (December 19, 2014). "U.S. exits Ally, auto bailout closed". USA Today. Retrieved July 20, 2015. ^ Healey, James R. (December 10, 2013). "Government Sells Last of Its GM Shares". USA Today. Retrieved January 18, 2014. ^ Krebs, Michelle (April 27, 2009). "Good-Bye Pontiac, Saturn, Saab, Hummer". Autoobserver.com. Archived from the original on November 4, 2012. Retrieved December 11, 2013. ^ Ahlander, Johan (January 26, 2010). "Tiny Spyker snaps up GM's Saab for $400 million". Reuters. ^ "Toyota Retakes Global Lead From GM on Disaster Recovery". Bloomberg L.P. January 28, 2013. Retrieved January 28, 2013. ^ "Toyota sold 8.4M vehicles in 2010 to hold top spot". The Seattle Times. January 24, 2011. Retrieved February 4, 2017. ^ "Corporate Officers". General Motors. Retrieved April 9, 2019. ^ Curry, George E. (May 1, 2014). "GM: intern advances to highest ranking Black in automobile industry". Our Weekly. Retrieved June 9, 2015. ^ "GM Design boss Ed Welburn retiring July 1". Autoweek. April 7, 2016. Retrieved March 2, 2019. ^ Terlep, Sharon (May 3, 2010). "GM To Take New Chevy Campaigns for a Spin". The Wall Street Journal (subscription required). Retrieved July 3, 2010. ^ "Dan Akerson to Retire as GM CEO in January 2014". GM Media (Press release). December 12, 2013. ^ Welch, David (March 19, 2011). "GM's Ammann Pushes to Expand Lending Operations He Dismantled". Bloomberg Businessweek. Archived from the original on March 26, 2011. ^ "About GM: Mary T. Barra". www.gm.com. Archived from the original on May 15, 2016. Retrieved June 9, 2015. ^ Krolicki, Kevin (February 24, 2011). "GM Posts First Full-Year Profit Since 2004". Reuters. Retrieved March 7, 2017. ^ "World Ranking of Manufacturers Year 2010" (PDF). OICA. August 2011. Retrieved March 8, 2017. ^ GM Press Release (January 20, 2012). "GM global sales up 7.6% in 2011 to 9.026M vehicles; China and US largest markets" (Press release). Green Car Congress. Retrieved January 20, 2012. ^ Zlomek, Erin (May 20, 2013). "B-School Commencement 2013: GM's Dan Akerson". Bloomberg BusinessWeek. Retrieved November 28, 2013. ^ Vlasic, Bill; Boudette, Neal E. (August 17, 2017). "Shell of Old G.M. Surfaces in Court Fight Over Ignition Flaw". New York Times. Retrieved June 19, 2018. ^ Isidore, Chris (April 24, 2014). "GM's $1.3 billion recall cost wipes out profit". CNNMoney. Retrieved April 24, 2014. ^ Kokalitcheva, Kia (January 4, 2016). "Lyft Raises $1 Billion, GM Joins As Investor And Driverless Car Partner". Fortune. Retrieved January 19, 2016. ^ Fitzpatrick, Alex (January 4, 2016). "Why General Motors Invested $500 Million in Lyft". Time. Retrieved January 19, 2016. ^ a b c d e "2009 Annual Report" (PDF). ^ "Board of Directors". US: General Motors. 2017. Retrieved February 25, 2017. ^ "mediaOnline" (Press release). Media.gm.com. January 5, 2000. Archived from the original on June 2, 2004. Retrieved July 19, 2009. ^ "mediaOnline" (Press release). Media.gm.com. January 3, 2002. Archived from the original on March 14, 2004. Retrieved July 19, 2009. ^ "GM Reports December 2005 and Year Results". Theautochannel.com. January 5, 2006. Retrieved June 1, 2009. ^ "2009 – 2014 Restructuring Plan" (PDF). ASDFGeneral Motors. February 17, 2009. Archived from the original (PDF) on February 18, 2009. Retrieved September 9, 2012. ^ "GM Reports 221,983 Deliveries in December; 2,980,688 Vehicles Sold in 2008" (Press release). Media.gm.com. January 5, 2009. Retrieved September 9, 2012. ^ "Chevrolet, Buick, GMC and Cadillac Post Sales Gains" (Press release). Michigan. PR Newswire. January 5, 2010. Retrieved February 18, 2010. ^ "General Motors 2010 Calendar Year Sales Up 21 Percent; December Sales Increase 16" (Press release). Michigan. PR Newswire. January 4, 2011. Retrieved April 25, 2011. ^ "GM's U.S. Sales Increase 5 Percent in December" (Press release). Media.gm.com. Retrieved January 6, 2012. ^ "Deliveries - December 2013" (PDF) (Press release). ^ "Deliveries - December 2014" (PDF) (Press release). ^ "GM, Chevrolet Lead with the Industry's Largest Retail Market Share Increases of 2015". media.gm.com (Press release). Retrieved January 19, 2016. ^ Kim, Soyoung (June 1, 2009). "Factbox – General Motors Bankruptcy Filing Law". Reuters. Retrieved July 9, 2009. ^ Johnson, Kimberly S. (August 27, 2009). "GM To Remove Its Mark from Vehicles To Emphasize Brand". USA Today. Retrieved October 12, 2009. ^ Taylor, Tom. "Car sales". Autocomparison.com. Retrieved September 21, 2012. ^ "GM plans to cut more than 14,000 jobs, close factories as downturn looms". TechCrunch. Retrieved November 27, 2018. ^ Petroff, Alanna (April 20, 2017). "GM says Venezuela has seized its car plant". CNN. US. Retrieved April 24, 2017. ^ "GM to drop Chevy brand in Europe to focus on Opel". Reuters. December 5, 2013. Retrieved December 21, 2013. ^ "GM Strengthens its European Brand Strategy". December 5, 2013. Retrieved December 21, 2013. ^ Bunkley, Nick (February 29, 2012). "Through Alliance, G.M. to Take a Stake in Peugeot". The New York Times. Retrieved March 7, 2017. ^ "GM Completes Sale of PSA Equity Stake". GM Media (Press release). December 13, 2013. Retrieved December 21, 2013. ^ "General Motors sells stake in PSA Peugeot Citroen". December 13, 2013. Archived from the original on December 13, 2013. Retrieved December 21, 2013. ^ "Peugeot in talks to buy GM's Vauxhall and Opel business". BBC News. February 14, 2017. Retrieved February 14, 2017. ^ Moreano, Giovanny (March 7, 2017). "JPMorgan likes GM's exit from Europe, predicts rally on Opel sale". CNBC. Retrieved March 8, 2017. ^ "GM Global Sales: January - December 2017" (PDF). General Motors. February 2018. Retrieved December 13, 2018. ^ Andrew C (August 30, 2010). "GM's China vehicle sales in 2009 rose 66.9 percent". 4wheelsnow.com. Archived from the original on October 7, 2011. Retrieved January 2, 2011. ^ "In China, Buick Bucks the Trend". Nightly News with Brian Williams. MSNBC. June 15, 2006. Retrieved October 12, 2009. ^ "FAW-GM Increases Capacity, Having No Plan to Introduce GMC Yet". ChinaAutoWeb.com. ^ "General Motors Sets New Sales Record in China in 2010". January 5, 2011. Retrieved November 1, 2011. ^ Blumenstein, Rebecca (October 30, 2007). "GM to Invest in Green Technology in China". The Wall Street Journal. Retrieved November 7, 2010. ^ "GM aims to double China sales by 2015". Reuters. April 18, 2011. Retrieved March 7, 2017. ^ Klayman, Ben (April 20, 2011). "GM's Baojun lineup in China could expand quickly". Reuters. ^ "General Motors Japan Limited：ゼネラルモーターズ・ジャパン株式会社". Retrieved January 19, 2016. ^ "Yanase opened Japan to Western cars". James B. Treece. March 31, 2008. Retrieved January 5, 2018. ^ "General Motors to build plant in Bekasi". August 12, 2011. ^ "Obama: 'Bailout Was Worth It'". Voice of America. October 14, 2011. Retrieved October 14, 2011. ^ "New Indonesian Manufacturing Plant". Panarmenian. May 11, 2013. Retrieved May 11, 2013. ^ Tan, Jonathan James (February 28, 2015). "General Motors to close Indonesian plant in June, stop Chevrolet Sonic production in Thailand". paulan.org. Retrieved March 2, 2015. ^ "GM's India Exit: The episodic events of shock, confusion and failure - ET Auto". ET Auto. Retrieved May 5, 2017. ^ "General Motors to stop India sales on rising losses - Times of India". The Times of India. Retrieved May 5, 2017. ^ "GM may be about to pull out of South Korea". Business Insider France (in French). Retrieved February 26, 2018. ^ "General Motors asks South Korea to help fund operations". Financial Times. UK. February 22, 2018. ^ Choi, Haejin; Jin, Hyunjoo (April 2, 2018). "GM Korea's March sales dive; seeks to halt one shift at Bupyeong plant". U.S. Retrieved April 3, 2018. ^ "Going Global". The New York Times. June 4, 2009. Retrieved June 6, 2009. ^ Muchira, Njiraini (February 28, 2017). "General Motors to exit East Africa with sale of stake to Isuzu". The EastAfrican. Retrieved December 24, 2017. ^ Agutu, Nancy (August 2, 2017). "General Motors changes name to Isuzu East Africa". The Star. Kenya. Retrieved December 24, 2017. ^ "South Africa arm of General Motors hit by wage strike shuts plant". South Africa News.Net. Archived from the original on July 14, 2014. Retrieved July 5, 2014. ^ Snavely, Brent (May 18, 2017). "GM to stop selling vehicles in once promising India, exit South Africa". Detroit Free Press. Retrieved May 18, 2017. ^ Fourie, Louis (2016). On a Global Mission: The Automobiles of General Motors International Volume 3 (1st ed.). Friesen Press. p. 1137. ^ Zimmer, Thomas. "Opel Models May Be Imported To Australia And Sold As Holden, No More German Layoffs Until 2018". Gm Authority. Retrieved March 7, 2017. ^ "Opel Pulls Out Of Australia". Gizmodo. August 5, 2013. Retrieved November 28, 2013. ^ Pettendy, Marton (November 17, 2017). "Where to for Holden and Commodore?". Motoring. Australia. Retrieved April 9, 2018. ^ a b "Holden announces it will cease manufacturing operations in Australia by 2017" (Press release). ABC News Online via Scribd.com. December 10, 2013. Retrieved December 11, 2013. ^ "Holden will cease operations in 2017". news.com.au. December 11, 2013. Retrieved December 11, 2013. ^ a b c Sloan 1964, pp. 24, 97. ^ "1914, The First V-8 Engine - Generations of GM". History.gmheritagecenter.com. Archived from the original on December 3, 2013. Retrieved November 28, 2013. ^ Kitman, J. (March 2, 2000). "The Secret History of Lead. The Nation. Retrieved August 17, 2009. ^ "1939, The First Fully Automatic Transmission - Generations of GM". History.gmheritagecenter.com. Archived from the original on December 3, 2013. Retrieved November 28, 2013. ^ "1962, The First Production Turbocharged Engine - Generations of GM". History.gmheritagecenter.com. Archived from the original on December 3, 2013. Retrieved November 28, 2013. ^ Rechtin, Mark (September 14, 2008). "GM's most widely traveled 1971 model was built for the moon". Automotive News. Retrieved January 9, 2017. ^ "1972, First Automotive Anti-lock Brake System (ABS) - Generations of GM". History.gmheritagecenter.com. Archived from the original on December 3, 2013. Retrieved November 28, 2013. ^ Lee, Robert (December 20, 1988). "Iron-Rare Earth-Boron Permanent US Patent # 4,792,367". ^ Sloan 1964, pp. 249–252. ^ "General Motors Global R&D". US: Prognostics and Health Management Society. 2013. Retrieved August 30, 2018. ^ "GM joins race for hands free driving by 2016". Detroit News.Net. September 8, 2014. Retrieved September 8, 2014. ^ "GM's Self-Driving Cars Are Coming to Michigan's Roads, Immediately". Fortune. December 15, 2016. Retrieved December 16, 2016. ^ White, Joseph (March 11, 2016). "GM buys Cruise Automation to speed self-driving car strategy". Reuters. Retrieved March 13, 2016. ^ "GM Buys Self-Driving Technology Startup Cruise". NDTV Gadgets360.com. March 12, 2016. Retrieved March 13, 2016. ^ Vogt, Kyle (October 9, 2017). "How we're solving the LIDAR problem". Medium. Retrieved October 11, 2017. ^ Harris, Mark (October 9, 2017). "GM Cruise Snaps Up Solid-State Lidar Pioneer Strobe Inc". IEEE. Retrieved October 11, 2017. ^ Carey, Nick; Lienert, Paul (October 3, 2018). "Honda to invest $2.75 billion in GM's self-driving car unit". Reuters. US. Retrieved October 4, 2018. ^ Welch, Davod (October 3, 2018). "GM's Cruise Draws $2.75 Billion From Honda in Self-Driving Pact". Bloomberg. US. Retrieved October 4, 2018. ^ Gibson, Kate (October 3, 2018). "GM gets Honda to invest $2.75 billion in its self-driving car unit". CBS. US. Retrieved October 4, 2018. ^ a b c d e Sloan 1964, pp. 313–339, Chapter 18, "The corporation overseas". ^ a b Sloan 1964, pp. 440–442. ^ Motavalli, Jim (July 14, 2011). "GM's Big Bet on the Made-in-the-USA Sonic Subcompact". CBS News. Retrieved March 7, 2017. ^ a b Kane, Mark (November 29, 2018). "RIP Chevy Volt: USA's Best-Selling Electric Car Of All Time". InsideEVs.com. Retrieved December 1, 2018. ^ "GM Surpasses Landfill-Free Facilities Commitment". GM.com (Press release). Retrieved March 8, 2017. ^ GM Adding World's Largest Rooftop Solar Power Installation to Zaragoza Plant Archived December 6, 2010, at the Wayback Machine.GM.com (July 8, 2008). Retrieved December 4, 2010. ^ Reuters UK (July 8, 2008).GM Europe puts solar roof on Spanish plant. Retrieved December 4, 2010. ^ Guardian (July 9, 2008). GM installs world's biggest rooftop solar panels. Retrieved December 4, 2010. ^ VentureBeat. General Motors invests $7.5M in rooftop-solar company Sunlogics." ^ "America's First Turbine Car". Conklin Systems. November 21, 1952. Retrieved December 4, 2010. ^ "General Motors 'SunRaycer'". Smithsonian Institution. Smithsonian Institution. Retrieved March 8, 2017. ^ Welch, David (October 2, 2017). "GM Plans 20 All-Electric Models by 2023". Bloomberg. Retrieved May 4, 2018. ^ Baldwin, Roberto (October 2, 2017). "GM will have 20 electric car models on the road by 2023". Engadget. Retrieved May 4, 2018. ^ Frank, Michael. "2004 Chevy Silverado LS1500 4WD Extended-Cab Hybrid". Forbes. Retrieved February 28, 2018. ^ "GM's Hybrid Propulsion System for Transit Buses". Archived from the original on May 26, 2007. Retrieved May 22, 2007. ^ a b c Brinkman, Norman; Eberle, Ulrich; Formanski, Volker; Grebe, Uwe-Dieter; Matthe, Roland (April 15, 2012). "Vehicle Electrification – Quo Vadis". VDI. doi:10.13140/2.1.2638.8163. Retrieved April 27, 2013. ^ a b c Eberle, Ulrich; von Helmolt, Rittmar (May 14, 2010). "Sustainable transportation based on electric vehicle concepts: a brief overview". Energy & Environmental Science. 3 (6): 689. doi:10.1039/C001674H. Retrieved June 8, 2010. ^ Jeff Cobb (November 3, 2015). "2016 Volts Account For 1,324 Sales Out Of 2,035 October Deliveries". HybridCars.com. Retrieved November 3, 2015. ^ Klippenstein, Matthew (November 6, 2015). "Plug-in Electric Car Sales in Canada, October 2015: The Wallet Ballot". Green Car Reports. Retrieved November 7, 2015. ^ Jeff Cobb (August 4, 2015). "2016 Chevrolet Volt Rated For 53 Miles Electric Range". HybridCars.com. Retrieved August 4, 2015. ^ Evarts, Eric C. (November 26, 2018). "GM to kill Chevy Volt production in 2019 (Updated)". Green Car Reports. Retrieved November 27, 2018. ^ a b Pontes, Jose (November 30, 2018). "Global All-Time Top 5 (Until Oct. '18)". EVSales.com. Retrieved December 1, 2018. ^ Cobb, Jeff (January 9, 2017). "Nissan's Quarter-Millionth Leaf Means It's The Best-Selling Plug-in Car In History". HybridCars.com. Retrieved January 10, 2017. As of December 2016[update], the Nissan Leaf is the world's best-selling plug-in car in history with more than 250,000 units delivered, followed by the Tesla Model S with over 158,000 sales, the Volt/Ampera family of vehicles with 134,500 vehicles sold, and the Mitsubishi Outlander PHEV with about 116,500 units sold through November 2016. These are the only plug-in electric cars so far with over 100,000 global sales. ^ Cobb, Jeff (August 10, 2016). "Global 10 Best-Selling Plug-In Cars Are Accelerating Forward". HybridCars.com. Retrieved August 13, 2016. As of June 2016[update], cumulative global sales of the top selling plug-in electric cars were led by the Nissan Leaf (over 228,000), followed by the Tesla Model S (129,393), Votl/Ampera family (about 117,300), Mitsubishi Outlander PHEV (about 107,400), Toyota Prius PHV (over 75,400), BYD Qin (56,191), Renault Zoe (51,193), BMW i3 (around 49,500), Mitsubishi i-MiEV family (about 37,600) and BYD Tang (37,509). ^ "Could the electric car save us?". US: CBS News. September 6, 2007. Retrieved June 24, 2017. ^ Matthe, Roland; Eberle, Ulrich (January 1, 2014). "The Voltec System—Energy Storage and Electric Propulsion". The Voltec System – Energy Storage and Electric Propulsion. pp. 151–176. doi:10.1016/B978-0-444-59513-3.00008-X. ISBN 9780444595133. Retrieved May 4, 2014. ^ Cora, Nucci. "GM, Segway roll-out Project PUMA". InformationWeek. Retrieved November 28, 2013. ^ Garrett, Jerry (November 28, 2012). "2014 Chevrolet Spark EV: Worth the Extra Charge?". The New York Times. Retrieved November 28, 2012. ^ Schultz, Jonathan (October 12, 2011). "Chevrolet to Sell Purely Electric Spark Hatchback in U.S." The New York Times. Retrieved October 12, 2011. ^ Voelcker, John (June 20, 2013). "First 2014 Chevrolet Spark EVs Now At CA, Oregon Dealers". Green Car Reports. Retrieved June 20, 2013. ^ Kane, Mark (October 30, 2013). "Sales of Chevy Spark EV Now Officially Underway in South Korea". InsideEVs.com. Retrieved October 30, 2013. ^ "Chevrolet Spark EV priced below $25,000 with tax incentives; Oregon and Canada added to markets". Green Car Congress. November 27, 2012. Retrieved November 27, 2012. ^ Fleming, Charles (September 12, 2016). "Chevy Bolt EV range is 238 miles: Prime time for the electric car?". The Los Angeles Times. Retrieved September 13, 2016. ^ Cobb, Jeff (September 9, 2016). "Renault Zoe Enters Market Slightly Ahead of Chevy Bolt As First 'Affordable' (Roughly) 200-Mile EV". HybridCars. Retrieved October 3, 2016. ^ Burden, Melissa (July 27, 2016). "Chevy Bolt EV to ship to dealers in fourth quarter". The Detroit News. Retrieved July 28, 2016. ^ "EERE News: GM to Buy Lithium-Ion Batteries Cells for the Chevy Volt from LG Chem". Apps1.eere.energy.gov. January 14, 2009. Retrieved June 1, 2009. ^ Léon, Aline (2008). Hydrogen Technology: Mobile and Portable Applications. Springer Science+Business Media. p. 287. ISBN 9783540699255. Retrieved August 23, 2014. ^ "1966 GM Electrovan - First Hydrogen Fuel Cell Vehicle". Hydrogencarsnow.com. Retrieved December 11, 2013. ^ a b Truett, Richard (September 16, 2002). "Fuel cell expert takes the long view". The Automotive News. Retrieved March 27, 2017. ^ "GM executive says hydrogen-powered cars could be on road in several test markets in 6 years". Mercury News. Associated Press. June 15, 2007. ^ Thomas, Ken (May 7, 2007). "'Flex-fuel' Vehicles Touted". USA Today. Retrieved September 15, 2008. ^ General Motors Statement on Flex-Fuel Vehicle Pledge General Motors. May 5, 2010. Retrieved September 9, 2012. ^ "2012 Flex Fuel fact sheet" (PDF). General Motors fact sheet. Archived from the original (PDF) on June 19, 2012. Retrieved November 28, 2013. ^ "Our Partners in Conservation General Motors". The Nature Conservancy. The Nature Conservancy. Archived from the original on April 5, 2013. Retrieved March 7, 2017. ^ "General Motors and Fashion Industry Target Breast Cancer Through Concept:Cure". prnewswire.com (Press release). General Motors Corporation. October 21, 1997. Retrieved October 28, 2015. the program enlisted the support of fashion designers Nicole Miller, Richard Tyler, Anna Sui, Todd Oldham and Mark Eisen to lend their artistic talents to GM'S Cadillac STS, Buick Riviera, GMC Yukon, Oldsmobile Bravada and Chevrolet Camaro Z28, respectively. The vehicles were sold by silent auction through the December issue of the Neiman Marcus Holiday catalog "The Book," and the funds were formally presented to the Nina Hyde Center at the Greater Los Angeles Auto Show in January 1997. ^ "The General Motors Foundation". Safe Kids. Safe Kids Worldwide. Retrieved March 7, 2017. ^ "Safe Kids USA Donates 500,000th Child Safety Seat" (Press release). WebWire. Retrieved December 27, 2011. ^ "PACE Program Growth — Third Quarter 2002" (PDF). Retrieved December 4, 2010. ^ Pace Partners. Retrieved September 9, 2012. ^ Corporate Giving – Details:General Motors Archived December 20, 2008, at the Wayback Machine.Business Week 2005. Retrieved July 9, 2009. ^ "General Motors Corporate Giving Guidelines" (PDF). GM.com. General Motors. Archived from the original (PDF) on March 8, 2017. Retrieved March 7, 2017. ^ a b "General Motors: A Reorganized Brand Architecture for a Reorganized Company " Merriam Associates, Inc. Brand Strategies". Merriamassociates.com. November 22, 2010. Archived from the original on June 4, 2012. Retrieved December 4, 2010. ^ Elliott, Hannah (April 27, 2009). "America's Fastest-Dying Car Brands". Forbes. Retrieved December 4, 2010. ^ "General Motors to remove its 'Mark of Excellence' logos from new cars – Drive On: A conversation about the cars and trucks we drive". USA Today. August 26, 2009. Retrieved December 4, 2010. ^ "Branded House or a House of Brands". Brand Matters. Retrieved March 7, 2017. ^ "GM Canada". Retrieved July 18, 2012. ^ Courtenay, Vince (January 20, 2011). "Daewoo Bowing Out as Brand, Company Name in Korea". Wards Auto. Retrieved March 7, 2017. ^ a b c John Barnard. "American Vanguard: The United Auto Workers During the Reuther Years, 1935-1970". Wayne State University Press, 2004, p. 212. ^ Kevin Boyle. "The UAW and the Heyday of American Liberalism 1945-1968". Cornell University Press, 1995, p. 21-22. ^ Isidore, Chris (September 24, 2007). "73,000 workers walk in nationwide GM strike". CNNMoney. ^ "UAW STRIKES GM: Pickets go up at automaker's plants". September 24, 2007. Archived from the original on September 25, 2007. ^ Isidore, Chris (September 26, 2007). "GM-UAW reach deal to end strike". CNNMoney. ^ CSERE, CSABA (September 2008). "General Motors Celebrates a 100-Year History of Technological Breakthroughs". Car and Driver. Retrieved March 20, 2013. ^ "President Dwight D. Eisenhower and the Federal Role in Highway Safety: Epilogue – The Changing Federal Role". Federal Highway Administration. May 7, 2005. ^ Fisse, Brent; Braithwaite, John (1983). The Impact of Publicity on Corporate Offenders. State University of New York Press. p. 30. ISBN 978-0-87395-732-8. ^ National Highway Traffic Safety Administration (July 1972). "PB 211-015: Evaluation of the 1960–1963 Corvair Handling and Stability". National Technical Information Service. ^ DeLorean, John Z. (1980). On a Clear Day You Can See General Motors. Avon. p. 51. ISBN 9780380517220. ^ Davis, Jr., David E. (April 2009). "American Driver: The Late Ralph Nader". Automobile. Retrieved August 16, 2014. ^ "GM compensation fund completes review with 124 deaths". Retrieved April 4, 2017. ^ "GM fined $35mn for delays in recalling faulty cars". Detroit Star. Archived from the original on May 17, 2014. Retrieved May 17, 2014. ^ "GM ignition lawsuits seek up to $10B for 'economic loss'". The Detroit News. Archived from the original on May 21, 2014. Retrieved June 6, 2014. ^ Vlasic, Bill (March 28, 2014). "An Engineer's Eureka Moment With a G.M. Flaw". The New York Times. "G.M. 's Road From Prosperity to Crisis". The New York Times. May 31, 2009. Retrieved June 1, 2009. Bunkley, Nick (May 25, 2011). "Automotive Industry Crisis". The New York Times. Retrieved September 9, 2012. Robertson, Heather (1995). Driving force: The McLaughlin family and the age of the car. McClelland & Stewart. ISBN 978-0-7710-7556-8. A history of the businesses of Samuel McLaughlin and family, and the beginnings of General Motors Canada Ltd.